Long Beach August 2-4, 2018 When Did You See The Sign? 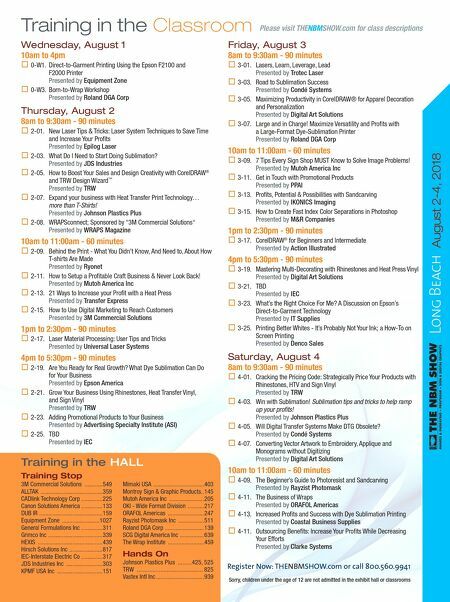 ™ VISIT US AT BOOTH #124 f e a t u r e d e x h i b i t o r s Universal Laser Systems Booth #711 480-483-1214 www.ulsinc.com PLS4.75 System with 9.3µm CO2 Laser – Only at ULS You will only find the advanced 9.3µm laser at Universal— compatible with all ULS platforms including the PLS4.75. Available in 30, 50 and 75 watts, the 9.3µm laser offers intricate details and cleaner cuts on wood, leather, plastic and more. It also completely eliminates weeding on many Siser ® and Stahls' ® heat- transfer materials for fabrics. Plus, ULS modular architecture and Rapid Reconfiguration ™ offer users a 30-second swap of the industry-standard 10.6µm to the 9.3µm laser in any system. Come see us for a live demonstration! Trotec Laser Inc Booth #603 866-226-8505 www.troteclaser.com Empower Yourself with a Trotec Laser Whether you are starting your own business or looking to grow an existing business, Trotec can empower you with the capabilities, materials and support you need. The company's versatile CO2 and fiber flatbed lasers can cut, mark and engrave a broad range of materials at processing speeds up to 140 inches/sec., making them the fastest on the market. Combined with its comprehensive line of competitively priced engraving materials and expert support directly from the manufacturer, Trotec has everything you need to grow a business. Visit Booth #603 and see how Trotec can empower you. Radian Laser Booth #517 714-278-4333 www.radianlaser.com 2D/3D Fiber Laser Systems Radian's 2D/3D Fiber Laser work stations feature the same high-speed, precision 3D marking as our open frame technology suite, but with the laser source and other components installed into a high quality industrial open or fully enclosed work station. The 3D laser system models provide the ability to mark over a curve without the need for a rotary or additional tools. 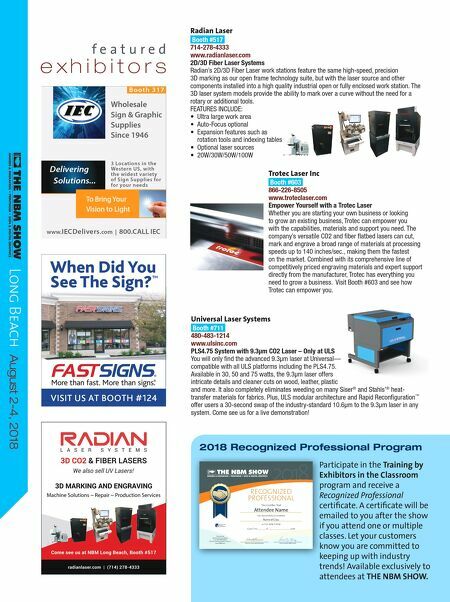 FEATURES INCLUDE: • Ultra large work area • Auto-Focus optional • Expansion features such as rotation tools and indexing tables • Optional laser sources • 20W/30W/50W/100W 2018 Recognized Professional Program 2018 RECOGNIZED PROFESSIONAL This Certifies That Attendee Name Name of Class has Successfully Completed at THE NBM SHOW Given This of , 2018 Exhibitor Training Coordinator Vice President, NBM Events Presented by National Business Media and THE NBM SHOW P.O. Box 1416 Broomfield, Co 80020 www.NBM.com PROFESSIONAL TRAINING & ACHIEVEMENT Participate in the Training by Exhibitors in the Classroom program and receive a Recognized Professional certificate. A certificate will be emailed to you after the show if you attend one or multiple classes. Let your customers know you are committed to keeping up with industry trends! Available exclusively to attendees at THE NBM SHOW.